10 Best Places to Visit in Dubai - Dubai is one of the most visited cities in the United Arab Emirates because it has many interesting sights. Dubai itself is a metropolitan city that is growing very rapidly, similar to Jakarta. The city has a variety of sophisticated buildings with modern architecture that will not be found in other cities. A variety of amazing places of luxury and very famous to all over the world such as Burj Al Arab, Dubai Mall, and much more can be found in this city. In addition to offering a complete facility that can spoil the tourists, the various luxury places also have a very unique form that is often used as a photo-taking place. Although Dubai is surrounded by deserts, Dubai has succeeded in developing its tourism sector to be highly developed successfully. The tourism sector in Dubai has even become the fastest growing source of income. Therefore, a visit to Dubai whether for a vacation or business certainly will be an impressive experience. The city located along the southern coast of the Persian Gulf in the Arabian Peninsula is very advanced and has attracted the world's attention with the success of building more innovative buildings than others. Building and innovative place in Dubai today have become a tourist attraction that is very interesting and enthused by the visitors. Want to know what attractions in Dubai should be visited? Here's the review. Burj Al Arab is one of the hotels in Dubai that has a luxurious architecture and is built on an artificial island. This seven-star luxury hotel was designed by an architect named Tom Wright. In addition to a very unique form of a building, the hotel also has a height of up to 321 meters. The altitude earned the title as the world's highest hotel ranked number four. Due to its unique shape, Burj Al Arab which consists of 66 floors has successfully become an icon of Dubai. A hotel set on an artificial island about 280 meters off the Persian Gulf coast can be a place to stay for those of you who are in the United Arab Emirates and want to enjoy world-class luxury facilities. To stay in Burj Al Arab, you have to pay approximately 20-30 million Rupiah each night. Jumeirah Beach is a very famous beach in Dubai and always crowded by tourists. The beach that stretches for 7 km is divided into 7 beaches where each part has its own uniqueness. Jumeirah Beach is worth to be one of the tourist attractions in Dubai are most often visited by tourists because this beautiful beach has white sand and blue sea water is clean. Among the 7 Jumeirah beaches are two fused beaches namely the beaches at Jumeirah Park and Wild Wadi. While visiting Dubai there is no harm to relax for a moment and lie on white sand in the sun. Dubai mall is a tourist attraction in Dubai next which is a pity to miss especially for tourists who have a hobby of shopping. Dubai mall is Dubai's largest shopping area and one of the largest malls in the world. Boutiques and famous shops from around the world can be found at the Dubai Mall. Visitors who come to the Dubai Mall can do frugal spending by utilizing the Dubai Shopping Festival is held every year so it can get a variety of promos and discounts. In this tourist spot in Dubai, there is also a world's largest candy store that can spoil sweets lovers and sweet foods. In addition, this mall is also designed with a very magnificent interior with a very large aquarium. The aquarium in Dubai Mall beside having a very large size is also inhabited by a variety of marine animals such as sharks, manta rays, and other amazing fish. Not only that, in Dubai Mall there is also an ice rink to play ice skating as can be found in one mall in Jakarta but with a larger maximum capacity, ie up to two thousand people. Palm Jumeirah or often referred to as Palm Island or Palm Island is one of 10 tourist attractions in Dubai are a must visit while being in this city. This unique artificial island has become a haven for tourists because here there are various sights, hotels, and shopping areas. While on Palm Island, tourists can find interesting sights such as amusement parks, beaches, aquariums, water sports, and more. Palm Island is dubbed as the island of dreams is indeed the right place for tourists who want to be pampered with a variety of luxurious entertainment facilities. In order to get to this island, you have to ride monorail trains that connect to the tram system. Unfortunately, this beautiful island is generally only visited by people with high income, because the cost to visit the island and the goods sold there are very expensive. The Burj Khalifa is the tallest tower in the world built by a very professional architect and genius. The tower built in the middle of the desert is the most suitable place for tourists who want to see the Dubai skyline from the top of the tower. On the lower floor of this tower, there is also a Dubai Mall shopping center. When boarding the tower, tourists will get a presentation through a multimedia monitor of the Burj Khalifa and the history of Dubai City. The 153-story tower is also built with a charming and magnificent design. In addition to the mall, inside Burj Khalifa, there are also hotels, apartment occupancy, office space, and other facilities. All facilities in Burj Khalifa can pamper tourists in luxury. Gold Souk is a destination for tourists who love gold and jewelry because of the tourist attractions in Dubai this one provides a variety of gold and beautiful jewelry. In Gold Souk you can find various types of gold with various shapes, qualities, and rust. Traditional markets are filled with shops selling gold and jewelry is indeed very suitable for you who want to buy new jewelry. 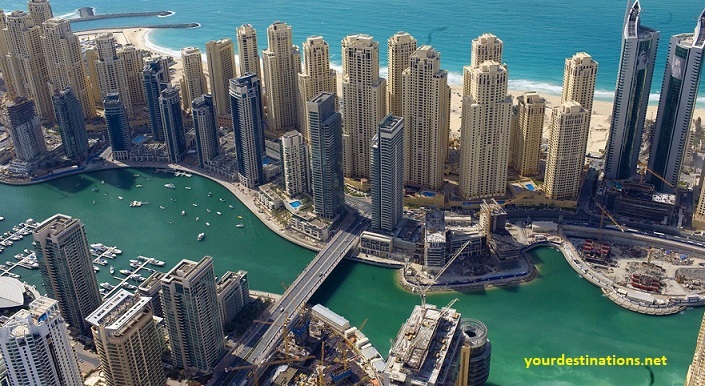 The famous market to the whole world has succeeded in making the city of Dubai is called Golden Land. This very elegant fountain has managed to become one of the most visited tourist attractions in Dubai by tourists. Dubai Fountain in Burj Khalifa has earned the title as the largest fountain in the world. Dubai's fountain pool has an area of about 12 hectares and can launch water up to as high as five hundred feet. The magnificent Dubai Fountain provides a show that can be watched at certain hours of the day. At night, the beauty of this fountain becomes more beautiful with the added light from the surrounding buildings. In addition, tourists can also enjoy the beauty of the fountain while relaxing accompanied by beautiful songs. Miracle Garden is a tourist attraction in Dubai is most appropriate for you garden lovers with various types of plants that have a variety of colors. Flower garden that can be found in Dubailand area was successfully built in a city filled with deserts and is a tourist attraction in Dubai is very interesting to visit. This beautiful garden has many types of plants that are designed to be a very beautiful shape. Miracle Garden also offers a variety of theme parks, including colorful peacocks, floral clock, butterfly park, and aromatic garden. The park that is open every 6 am to 6 pm can be accessed by paying around one hundred thousand rupiahs for adults. Meanwhile, for children under 3 years old can enter the park for free. Wild Wadi can be a choice of places to vacation with family when they are in Dubai. Wild Wadi is a water park located on Jumeirah Beach and has managed to become a favorite tourist spot in Dubai for tourists who come with family. The water park has a very complete facility and can satisfy all visitors who come to play water there. Well, that's a list of recommendations of the sights in Dubai that you must visit. Which tourist attractions would you like to visit later? Share please!